So many of you have asked us to share our recipes with you, and this one was a favourite dish this year. Nikki made it up, but it is essentially a Mediterrenean fish dish, making the most of the fresh seafood available to us. Any white fish or shellfish that your fishmonger has on offer. Fry your onions and garlic with the ginger with a good plug of olive oil until soft. Add the dry spices, cook out for about 2 minutes staring constantly. Now chuck in the passata, puree and wine, the amount should be to make a good sauce and really depends on you – reduce down for about 40 minutes. Skin and bone your fish, and place it on the sauce and cover with foil to steam through until firm and not over cooked. Before the end of cooking, throw the mussels and langoustines on top and steam for a few minutes until cooked through, then throw on the parsley before serving. Best with local boiled potatoes with butter! A voyage in the Canaries aboard Bessie Ellen is so far away from the usual winter sun packages. You will be amazed at just how much diversity there is here in the far western group of islands offering you a very different winter break. Situated 180NM off the coast of Morocco, the western islands of Tenerife, La Palma, Gomera and El Hierro rise out of a sparkling cerulean sea and provide a a second home to Bessie Ellen. I have spent many winters here, and would be thrilled to sail with you to discover your own Canary Adventure. All the voyages will start and finish in the modern marina of San Miguel. Chosen for its proximity to the airport and the shelter of the waters, it provides an ideal location as an embarkation point, giving a gentle start to your holiday. Whales and dolphins are abound here and none are more easy to find than the Pilot whale. Not a true whale, but a species of dolphin, these quiet and gentle mammals are easy to spot in the calm waters under Tenerife. As you set sail, the whales come close to the ship in large pods of up to 20. They float or “log” on the surface in these groups, diving up to 2000 ft to feed on squid that live at great depth. Other whales of the larger species can be found to the south of Gomera and include Brydes, Fin and Sperm whales. Supper happy dolphins are easier to spot, the playful bottlenose form groups around the Masca cliffs, providing a great chance for you to photograph these incredible creatures in still, crystal clear waters. Spinner and Atlantic spotted dolphins tear out of the waves alongside us as under full sail, Bessie Ellen reaches up to 9 knots sailing between the islands. Leaving the glittering sea behind, it’s time to travel inland to visit some of the greener islands, and to get there, we sail. Whether you are a seasoned sailor or have yet to set foot on a boats deck, part of the thrill of your holiday is taking part in hauling up sails and handling the ship’s Helm (wheel), learning some navigation and watching the ocean miles slip away. Over the horizon lie new lands ready to welcome you to their own ocean paradise. My favourite island is La Palma, so green and unspoilt by commercial tourism and retaining the historical towns of 400 years ago. There are two ports to choose from here, Tazacorte in the west where the banana plantations reach the shore and the black sand beaches offer inviting cool waters to swim after a hot day; or the more genteel capital of Santa Cruz, a typical colonial merchant town strung out along the shore, flanked by green mountains which soar up into the clouds. Although a little cooler, the city is a great place to wander through, sample some local wine and cheese or even take part in one of the many festivals held here. A typical stopover here will include a day up at the top of the massive crater for a decent walk and stretch of the legs. The crew hire a van and drive you to the very top of Taburiente, 2,400 meters above the sea. This outstanding national park provides some great walks of different distances and levels of difficulty. I know the area well now and choose the easier route passing round the edge of the caldera where the views are vertical to the sea below. On a clear day you can even see Bessie Ellen in the marina. At the end of a 2 hour hike/ walk, the crew arrive with a picnic lunch before driving you back down the mountain, through the cloud forests of juniper and laurel. Take a brief dip in the waterfall before heading back to the ship for a dinner of something amazing from the local markets here. Now, if you are not well and truly tired, and you should be, there are plenty of salsa bars in the towns to enjoy until the small hours. I am a great believer in the ship as a mode of transport set to arrive at unique places and explore. Gomera is one of these little gems of islands where you really feel you can relax. I call it flip-flop island, a place where life runs at a much slower pace. The island is small and public transport routes, combined with well structured walks, mean you can see much of the island in one day. The top of Gomera is ringed by the cloud forest. Stone peaks named by the Guanches with mythical names rise up out of terraced hillsides. Palms and canes rustle in the breeze as you pass by on well worn tracks and, if you are lucky, you will hear the local whistling language, a language of trilling notes used as a way of communicating between the deep ravines and valleys. From the lush green at the top, the landscape changes as you reach further down towards the sea becoming dryer and less fertile. Cactus and lizards bake in the sun and the sea surrounding you, beckons for a swim. As with La Palma, there are two very different places we visit. The small town of San Sebastian is just delightful and is steeped in history – Columbus stopped here on all his explorations to the new world to take water and little his fleet. He also had a lover here which may explain why! Life in town is simple, the gaily painted streets lead to a shaded square which seems to be the hub of local life. Nothing can be more pleasing than watching the world go by here…that is if the crew let you! San Sebastian has become the beach of choice for our internship game of Frisbee. Played out on the sand at the edge of the bay, the townsfolk cheer as the Bessie Ellen arrives for a highly competitive game that is a cross between frisbee and rugby. Not for the fainthearted, and perhaps after a few bruises it’s time for a swim and a cold beer. Sailing round the coast passing scorched red cliffs, the next stop is to explore the 18th century tuna factory, nestled at the bottom of a steep barranco. The ruined buildings are worth a visit and the fishing from our deck is just perfect. Sometimes we barbecue here as the suns rays bathe the beach in hot sun till late in the afternoon. Onwards to Vueltas and Valle Gran Rey, or valley of the great King. And it is here, once the anchor is down you can dive out of the rigging into those velvet waters, cooling off after a hot day. Snorkelling with manta rays is great here, plus there is the opportunity to walk up the verdant valley to steep cool waterfalls. Once night falls, the stars here just glisten against the black sky. The cool air is perfect to lie and gaze aloft, taking pictures and understanding ancient constellations. Why not indulge in a midnight swim under this starlit sky, which is mirrored with the stars below as the bioluminescence bursts into life and we float on an ocean of space. El Hierro is far to the south and with the prevailing wind this island proves hard to reach. Restingua at the southern end made headlines recently when the underwater volcano erupted continuously for about 5 months. Now it has settled, this small community is a quiet place and it is here we get the best fish. Giant fish, wahoo and kingfish nearly two meters long chase brightly coloured lures. Tuna and bonito are exciting to catch and perhaps with help to land it will be your fish dinner today! Flying fish leap joyously from the waves, a sliver of silver against the onyx of the lava. Above though, a totally different world awaits. Small farms with sheep and goats range the lush green valleys, and it is this island that provides all the others with vegetable produce not imported. The bus runs from Puerto Estaca and along with children and chickens, the ride is exhilarating. So, that’s my Canary life, but there is always more to explore and share with others, so if you find this your kind of adventure, why not give me a ring to talk over possibilities? I have spent some time over the last few weeks, taking a closer look at the demographic of our customer base, noticing that many of you are single travellers. For those of you who are yet to voyage with us, a holiday afloat on board Bessie Ellen offers a new travel experience filled with various outdoor pursuits, meeting new people and combining a greener way to travel with comfort and adventure. From the moment you step on board the ship it becomes your floating home. Because we are focused on safety, and the crew are well aware that not everyone is nautical, the first thing we aim to do is teach you the ropes and terminology, thereby, enhancing your ability to take a more active role in your exciting new adventure. Most people are surprised how quickly they get the hang of it. 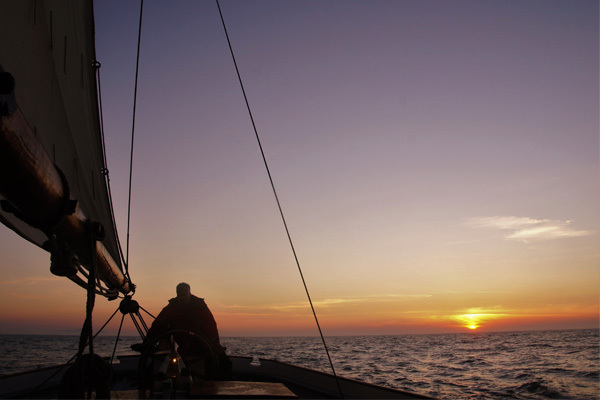 Day to day, we tend not to follow a strict itinerary, instead sailing to where the wind and weather dictates. Cruises are generally around islands where there is so much to see and explore, meaning that the day is frequently broken up by joining in with new found friends to set foot on deserted islands or land upon secluded beaches for a stroll and a picnic. Evenings generally find us anchored up in an idyllic spot to enjoy some great food, story telling and possibly live music followed by a beer or glass of wine on deck to soak up the ambience, views and often breathtaking sunsets. Experience has taught us that this memory making leads to some of your fellow guests becoming lifelong friends with whom you will enjoy other adventures in the future. If you have any queries about a voyage on board Bessie Ellen, then please do get in touch with myself, Nikki – I look forward to hearing from you. We love to forage for free food, and mussels are bountiful and easy to find in Scotland – but make sure you watch out for the friendly seals! Wherever you are in the UK, there will be mussels abound, but, as the story goes, only eat them when there is an “R” in the month. Before cooking, drop them in a bucket of cold water for about 4 hours so they rid themselves of grit. Clean the shells from any barnacles, remove the beard and wash in cold water. Put on the lid on and leave to simmer, keeping an eye on the mussels to see when they start to open. This will take around 10–15 minutes. Remove the lid and taste the juice to see if it needs seasoning, add your chopped parsley and voila – a feast fit for a king. 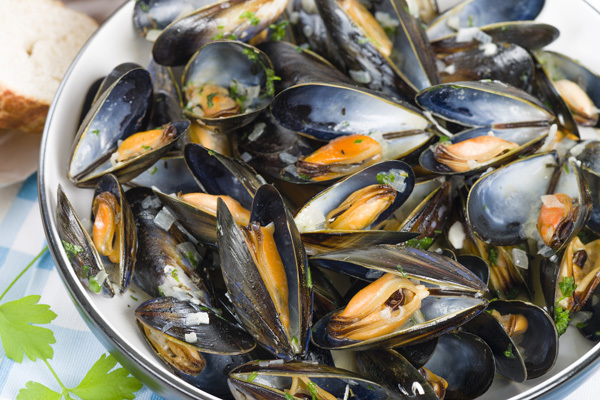 Remember to discard any mussels which are still closed at the end. Another method is to use exactly the same ingredients but steam the mussels in a large pan until open. Drain, then when cooled, pop the mussel out of the shell and add to the pan of ready cooked onion, garlic and parsley. Serve with a hunk of buttery bread, preferably on a beach somewhere remote. After 18 months at sea and 20,000 NM, from N57 55’ to N27 42’ and back again, Bessie Ellen will be laying up in Denmark for a well earned rest at her second home, Ring Andersen’s shipyard in Svendborg. With the ever-growing job list on the table, the workload seems enormous – especially for our small team. 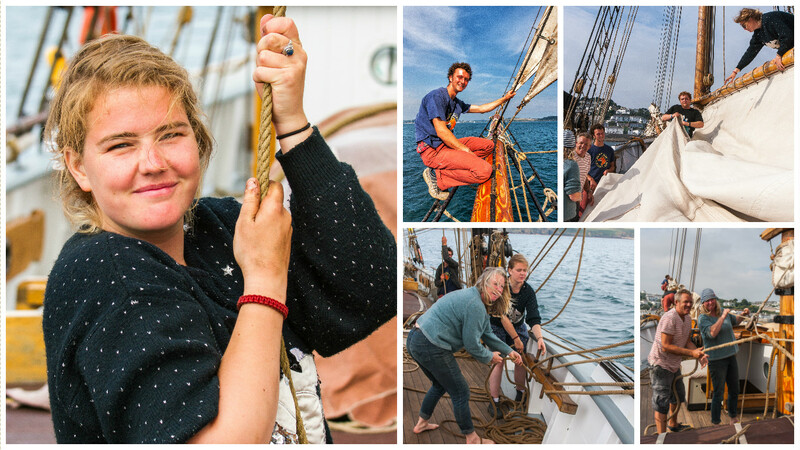 As a result of this, we are after keen volunteers who would jump at the chance to experience working on a classic tall ship, and one of the oldest trading ketches around. We would need you to be aiding us in the ships refit, all while learning new skills and re-discovering old ones. We hope to extend our dynamic team, building on values of friendship and learning to engage in a different, rewarding rhythm of life. The dates during which we would need this extra help on board are between the 29th September to the 30th November – obviously we wouldn’t be expecting you to work for this whole period, but we do ask for a minimum commitment of two weeks per volunteer so that you can really get your teeth into the work and bond with team. 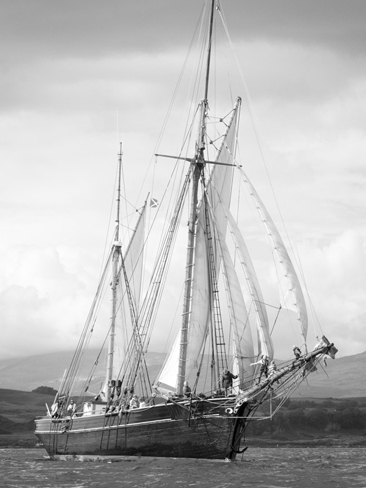 Food and accommodation will be provided in exchange for your help in overhauling the rigging and spars, engineering maintenance, hull work and renewing carpentry. There will be general skill jobs such as sanding, varnishing and painting, with a few marginally more technical projects like replacing and servicing rigging, creating new crew accommodation, and sorting a new auxiliary generator set. As well as this, Bessie will need a ballast removal and tank testing – and a whole heap more! As you can gather, it will be a busy time, but providing we have the right team it should all be good fun. If you are well qualified in boat repair and other relevant skills, we do have paid positions available as well – you will be well appreciated. If you fancy this great opportunity, please do let me know and I can answer your questions and vice versa. Email me with your interests and skills (nikki@bessie-ellen.com), and we will go from there – can’t wait to meet you!